Can You Really Make Money With The ReceiptPal App? This is an app that you can download for free on the Google Play store that, reportedly, can earn the user some extra income. But can you really make money with the ReceiptPal app? We’re always interested in earning extra money with apps and side-hustles… so we decided to download this one and give it a try. The Basics: What Is ReceiptPal? It has been downloaded over 100,000 times, has a 3.5 star rating, and quite a few 5 star reviews. We’ve seen apps like this before… but we wanted to know how this app differed from other receipt-scanning programs. So we opened up the Read Me to see if there was really any difference between this and other similar offerings. So far, it seemed like every other receipt scanning app that we had ever used—but we were still determined to get inside and have a look around. So that’s what we did next. We opened up the app, and were immediately greeted with this screen. Needless to say, we were disappointed by this—but we decided to do what we could and register anyway. 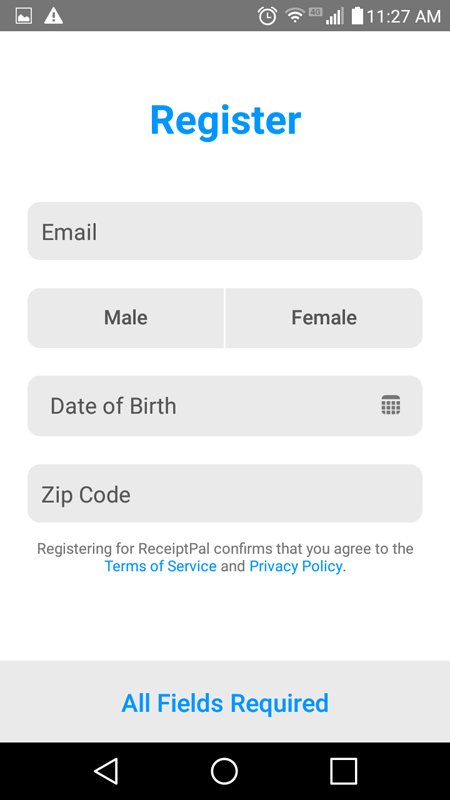 Registering with the app was a pretty simple process. Here’s a screen shot of what it looked like. We filled it out and submitted it—after which, we were told that we just needed to verify our email address to complete the registration process. We received the email pretty quickly, and confirmed it by following a link (pretty straightforward process). Next, we were taken to this screen, which pretty much told us that we would have to wait until a slot became available to actually use the app. This left us at a bit of a standstill, but there was still more work to be done. 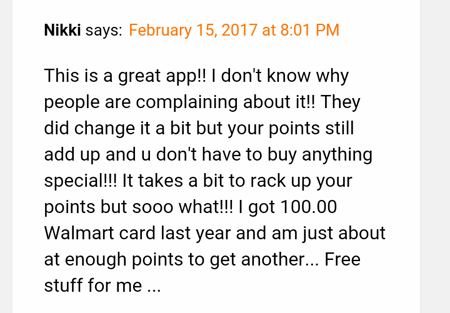 Next, we decided to turn to the Google Play Store to check out some reviews for the app. We were curious about whether or not you could actually make money with it, and wanted to know exactly what we could expect if/when we actually got to use it. Here was the first review that we found that gave us a hint about what we could expect. 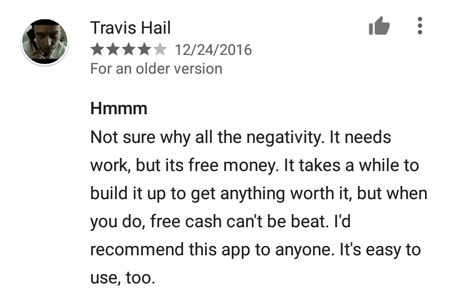 This review said that the money can be slow to build up—which is actually pretty typical of these types of apps, so this wasn’t surprising. We continued onward, and found these reviews—both of which stuck out to us as very helpful in determining how much you could actually make with the app. On one hand, we see that it took someone ‘several months’ to earn $25. Someone else said that they had redeemed 2 $100 gift cards thus-far, but they didn’t say how long it took to build these up. Finally, we found a more detailed review that seemed to provide a much better picture of how long it can take to earn cash with ReceiptPal. This review gave us a very specific timeframe (two years), and a specific monetary amount for compensation ($150). This equals out to $75 a year, which sounds about right for an app like this. 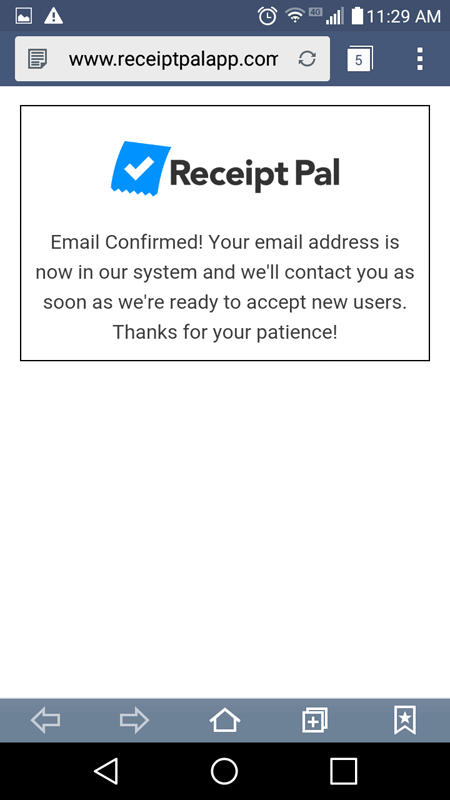 Does ReceiptPal Work Well As An App? We did everything we could within ReceiptPal, and never had any sort of issue. We didn’t experience a single glitch or frustrating page feature… so in our limited experience, the app seemed to work very well. Some reviews, however, tell a different story. Some people say that the app doesn’t work as well as it used to. Some people have been so concerned lately that they’ve even withdrawn all of their points, out of fear that they would lose them if something weird happened to the app (a glitch or a bug, etc.). Some reviews even described incidences where points did disappear. 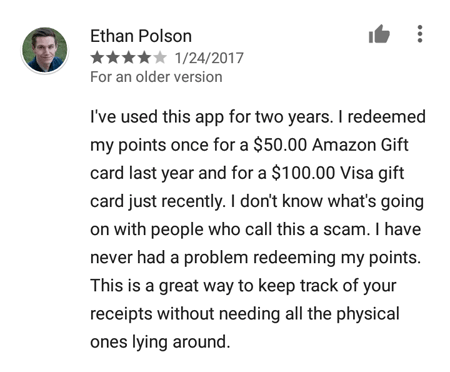 In one review, a user said that they had uploaded 180 receipts, but didn’t have a single point to their name because a glitch removed them all. Granted, it is possible that customer service could be contacted about these issues, but it still seems pointless to have to deal with it when you’re making $75 a year. Plus, it’s not really ‘free’ money, because you have to scan receipts and upload them to get points—so you technically have to work for every penny and point. And when you don’t get any points, or your points get erased, it’s a lot like doing all the work for nothing—and that isn’t something that I’m interested in. 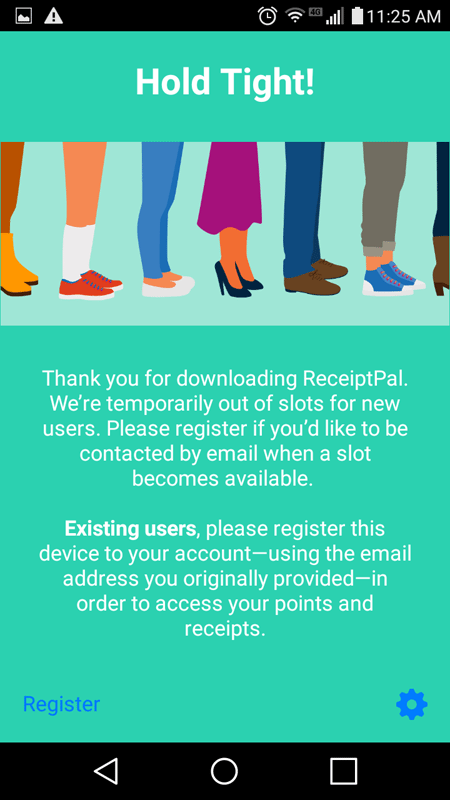 How Much Does ReceiptPal Actually Pay? I went online and did some digging, and found out that it takes 350 points on this app to earn one dollar on an Amazon gift card. If you save up 17,000 points, you can cash them in for a $100 Amazon gift card. Points in this app end up being worth more as you build more up, so it’s in your best interested to leave your points in your account until you either need them or are really ready to cash out. I also found out that receipt uploads usually get processed pretty quickly—within 24 hours, in most cases. I have also heard that this app limits the number of receipts that you can submit each week—which pretty much limits the amount of money that you can earn. This certainly seems like a downside of the app, in my opinion. It also seems that failing to submit receipts within a certain amount of time can also get your points removed. Points expire just 90 days if you fail to keep your account active. Basically, this means that you need to keep uploading receipts on a regular basis to keep your points from expiring. I did a Google search to find out what other people were saying about the app—and found something quite interesting that I felt was worth pointing out. I can’t say for sure—but I’m not sure how many of the ‘postive’ reviews for this app that are floating around out there are actually real. Notice any similarities? I’ve seen a lot of these types of reviews circulating about this app—and they seem a bit strange to me. They all seem to downplay negative reviews by saying ‘I don’t know what people are talking about,’ or, ‘I don’t know why people are crying about it,’ etc. They also combine a number of other common elements–almost like they follow a template. I’m not necessarily saying for sure that this is sketchy review-placement—but I am saying that it just seems fishy to me—fishy enough that I am inclined to slightly doubt the positive reviews that I see which contain elements like this. 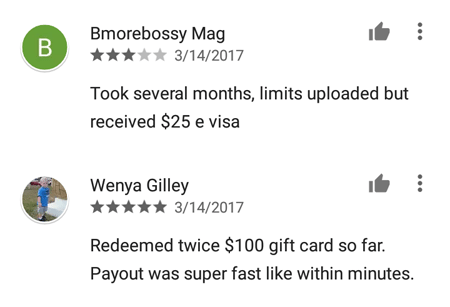 A lot of these reviews also reference ‘free money,’ which is actually not true—you need to work for your money on this app by uploading receipts. So yeah… I will admit that I was a bit leery about this. I really like the idea behind these types of apps. I really do. We all end up with receipts… and being able to scan them for cash is almost like getting cash rewards on purchases—and I’m all about the cash rewards! But this app really left me wanting in a few different ways. First of all, the waiting list kept me from even getting to try it. Secondly, the money that you can make seems to be a bit negligible—especially when you consider that you have limits to how many receipts you can actually upload (This fact, keep in mind, came from online sources. I was not actually able to use the app to verify it completely… but people in Google Reviews have said the same thing.). And finally, the reports of bugs and glitches are simply far too common for me to ignore. Perhaps if I actually get to try it for myself it will change my mind. 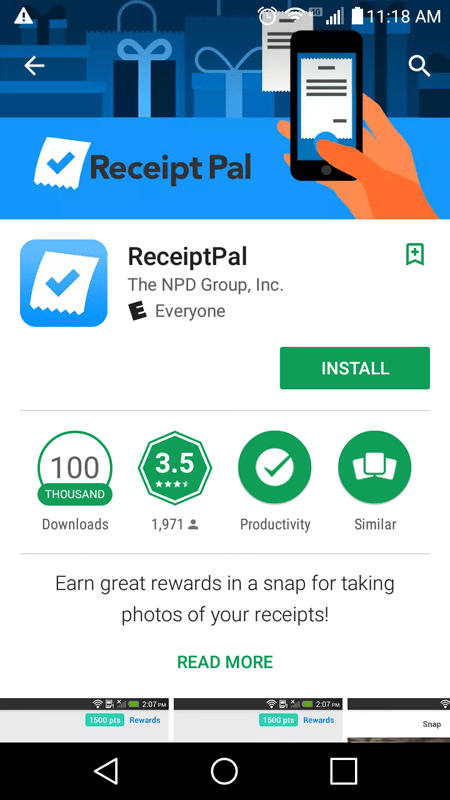 But as of right now, based on its reputation in the Google Play reviews and online, it would seem that there are better ways to make extra cash than with ReceiptPal. This app might be especially useful when used in conjunction with other receipt scanning apps. But by itself, it just seems to require more effort than it's worth. Should you download this app to your phone? Yes, it does take some time to earn some money, but it is worth it. Only takes a couple of seconds to snap a picture of your receipt.